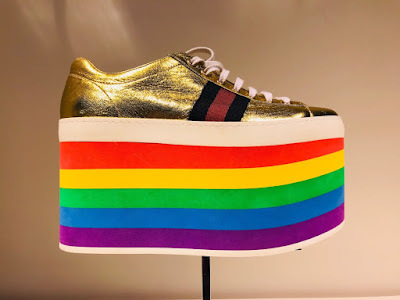 The Total CIO | Andy (Avraham) Blumenthal: Gucci Shoes WOW! So we're down in Florida. It's pouring today, so we decide to go to Sawgrass Mills. When the rain let's up, we decide to go outside to this one row of stores that is like designer row. We went into Robert Graham, Ralph Lauren (the purple label), Roberto Cavalli, Versace, Gucci, and more. We saw this nice Chasidic couple in Gucci. He looked at me and me and him--he was buying his wife a gift and I was "window shopping" and taking some cool photos. We gave each other the thumbs up. The shoe here was from the Gucci store. It's definitely a brand standout!